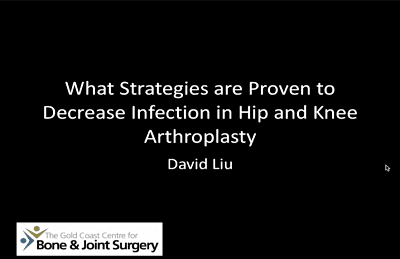 Dr. David Liu reviews the current literature and recommendations on steps that can be taken preoperatively and intraoperatively to prevent infection in total joint arthroplasty patients. One of the most emotionally draining complications of joint replacement surgery – for the patient and the surgeon – is a periprosthetic joint infection (PJI). For that reason, David Liu, MBBS, FRACS, from The Gold Coast Centre for Bone & Joint Surgery in Queensland, Australia, stressed the importance of preventing this devastating complication in his presentation at the ICJR Australia meeting earlier this year. Unfortunately, he said, few prevention strategies are scientifically proven to decrease PJI. In his presentation Dr. Liu reviewed the current literature and recommendations for steps that can be taken preoperatively and intraoperatively to prevent infection. Glycemic control. Optimizing the patient’s medical status is important. It is well known that uncontrolled diabetes and elevated preoperative blood glucose increase infection risk, but there is currently no definite threshold to establish a clear preoperative recommendation for glycemic control. Smoking. Smoking is known to impair wound healing, decrease immune function of the patient and increase the risk of infection. But smoking-induced changes are partly reversible and smoking cessation is one of the few interventions that are scientifically proven to reduce infection rates. Anemia. It is important to optimize the patient’s hemoglobin levels preoperatively as allogeneic blood transfusion is a significant risk factor for PJI. Staphylococcus aureus screening and decolonization. The literature is unclear as to whether screening and decolonization are effective preventive measures, possibly because some patients remain carriers even after treatment. Advance skin preparation. There is evidence that the use of chlorhexidine gluconate (CHG) wipes is effective in reducing surgical site infection, possibly because this is a “whole body” application that stays on the skin, unlike CHG soaps that are washed off. Intraoperative skin preparation. Chlorhexidine combined with alcohol is clearly superior to other combinations for skin preparation. Surgical draping. Because regular clear adhesive drapes may increase the risk of infection, Dr. Liu recommends using Ioban drapes. It has also been shown that rolling a sterile stockinette onto the leg increases infection risk, and the current recommendation is to disinfect the foot and not roll the stockinette proximal to the surgical site, and finally secure the stockinette with adhesive wrap. Laminar flow. Current literature shows no difference between laminar flow ORs and ORs with no laminar flow. Dr. Liu warned that having laminar flow may make the surgical team complacent about other important factors such as operating room traffic and etiquette. Surgical helmet systems. Similar to laminar flow, there is conflicting evidence as to whether helmet systems decrease infection risk during joint replacement procedures. Dr. Liu speculated that these helmets may also give surgeons a false sense of security. Glove changes. It is important to change gloves after draping, as this is the stage at which gloves are most frequently contaminated. Gloves should also be changed frequently during a long operation and before cementing. Not only the surgeon, but also the assistants should be changing gloves. Infection prevention remains an important aspect of patient care in joint replacement. However, there is a discrepancy between strategies believed to be important and current evidence-based guidelines on their actual effectiveness. Click the image below to watch Dr. Liu’s presentation from ICJR Australia. Bohl DH, Shen MR, Kayupov E, Della Valle CJ. Hypoalbuminemia independently predicts surgical site infection, pneumonia, length of stay, and readmission after total joint arthroplasty. J Arthroplasty. 2016;31(1):15–21. Brown NM, Cipriano CA, Moric M, Sporer SM; Della Valle CJ. Dilute betadine lavage before closure for the prevention of acute postoperative deep periprosthetic joint infection. J Arthroplasty. 2012;27(1):27-30.